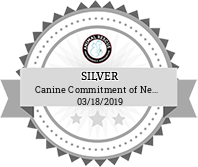 Canine Commitment is a dog rescue in New Hampshire, saving dogs of all ages, sizes, and mixes from southern areas of overpopulation and finding them loving homes in the New England area. Please see the guidelines for working with our organization below. We obey all laws in the state of NH but also require two DAPPv vaccines prior to transport. Doobert retains 5% of the amount donated to offset our costs and develop new software. Check this box to pay the 5% on top of your donation so the 5% is not withheld from the Organization. Are you sure? Do you want to delete this Organization? OR You can also transfer the ownership of this Organization to another User. Having your profile verified provides an additional level of confidence to Doobert organizations that you are a reputable animal rescue volunteer. When you apply for verification, we use the information provided to check references, verify your driving status and confirm the information you provide. If we have additional questions or need more information to verify your profile, we'll reach out to you. Doobert is proud to partner with the Animal Rescue Professionals Association to indicate Doobert volunteers that have successfully passed ARPA Certification exams. For more information about this exam please visit their website at https://www.animalrescueprofessionals.org/certified-rescue-transporter-exam/. If you successfully pass their exam we will update your profile to display your certified status. Your contact request was sent successfully. You have been successfully subscribed for Doobert Newsletter. Are you sure, you want to Un-Link your facebook account from Doobert.com? You signed into Doobert.com by using your Facebook e-mail and password. If you de-link your Facebook account from your Doobert.com profile we will convert your Doobert.com account to use your e-mail for you to sign-in with, and we'll send you a link to set your password.